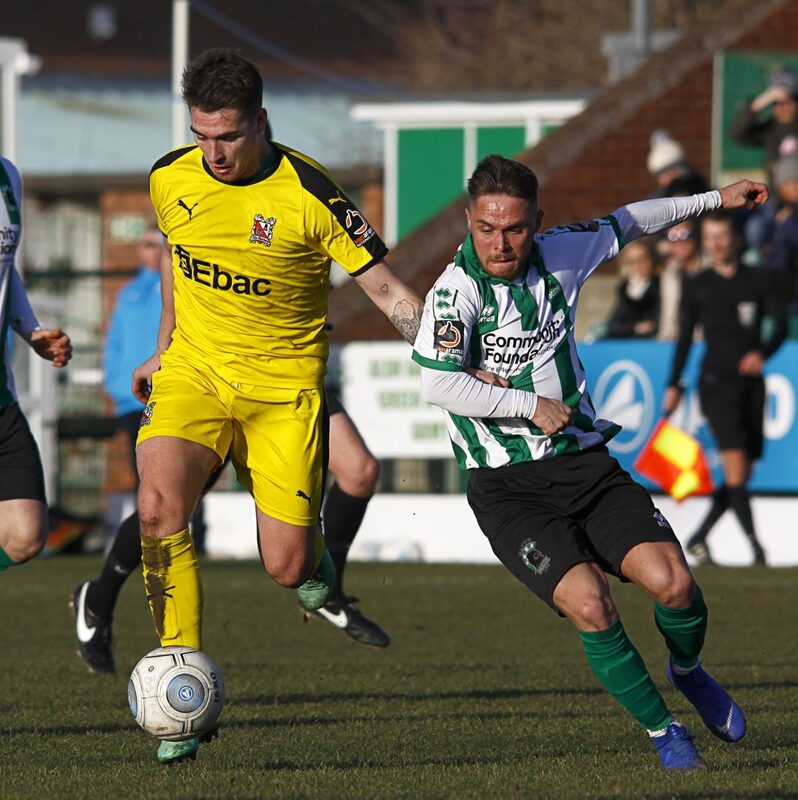 Stephen Thompson’s controversial 34th minute penalty condemned Blyth Spartans to their fourth consecutive defeat in all competitions. Jordan Watson was adjudged to have fouled Jordan Nicholson in the penalty area, Thompson stepping up to send Peter Jameson the wrong way. Five minutes from time Bradley Fewster was brought down in a similar fashion in the Darlington area – this time referee Andrew Kitchen waved away appeals from the 1,597 strong crowd. Alun Armstrong made one change from the side that lost 1-0 at Leyton Orient, Adam Wrightson replaced Nathan Buddle as Spartans re-jigged their formation. Blyth started off well when in the 4th minute, Liddle curled in a free kick that was guided towards the near post by the wind. Maddison tried to catch the ball and dropped it but Darlington were able to get the ball away. Liddle was involved in play again in 23rd minute when he whipped in a corner that reached the feet of Maguire, who twisted and turned inside the box then managed to get a shot away that went over the bar. In the 25th minute, Darlington had a chance when Galbraith sent a free kick in the Blyth box which Thompson got a glancing header on but it went just wide at the far post. Darlington got another chance as Thompson got his head on the end of a cross by Trotman but Jameson was able to save it. Jordan Nicholson tumbled under the slight contact and Kitchen pointed to the spot, to the dismay of everyone in attendance. Blyth got a chance to equalise when Green whipped in a free kick that went Maguire just outside the box who laid it off for Wrightson. Wrightson then smashed his shot wide of the near post. At the start of the second half, Nicholson had an audacious half volley from outside the box that went over the bar. In the 52nd minute, Spartans got a great chance to equalise when Liddle whipped in a cross and Maguire came running in at the near post but his header went wide. Darlington thought they had doubled their lead in the 65th minute when Thompson put the ball in the back of the net but the referee didn’t give as the goal as a Blyth player was fouled in the box. In the 66th minute, Liddle was forced to off with an injury and he was replaced by Nathan Buddle. Blyth continued to look for an equaliser with second half substitute Holmes having a thunderous strike at goal which was saved by a diving Maddison. Darlington nearly doubled their lead in stoppage time when Elliot got the end of a through ball and was one on one with Jameson but Jameson was able to make a save. Spartans will be disappointed with the result but will look to regain their form when they travel to Leamington on the 16th February. Their next game at Croft Park will be against Kidderminster on the 23rd February.